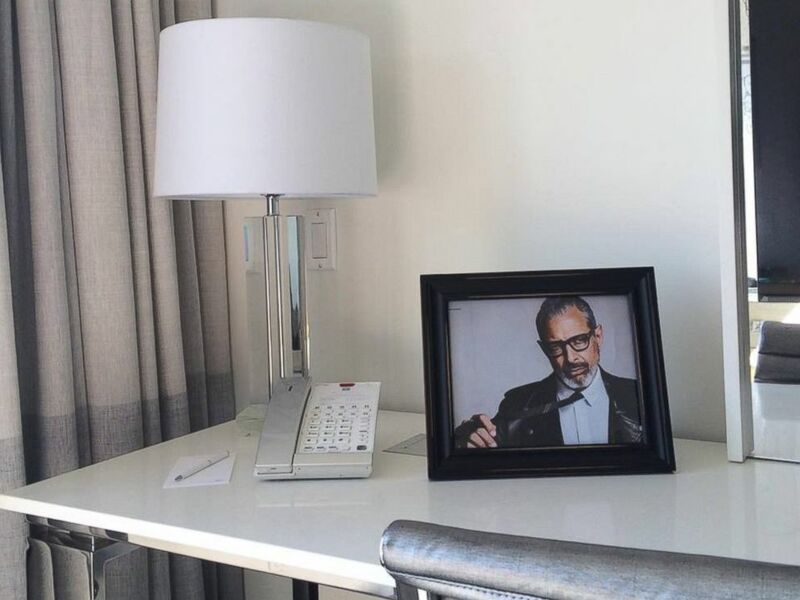 One man had an odd request for his room at the Huntley Hotel in Santa Monica, California: Framed photos of Jeff Goldblum. But the hotel was happy to oblige. "We received the request and it was kind of out of the ordinary," David Cohen, the director of the hotel’s front office, told ABC News. "We always try to meet any requests the guests have at the hotel. When I saw the request come in, it was for a wedding guest for a big weekend -- it wasn’t a gag, but an outlandish request. We just wanted to meet it because it was within our realm to do." Cohen said he and his employees printed the pictures in color and put them in frames. They were already in the rooms when the guests arrived. Seth Freedland, the man who asked for the Goldblum pictures, said he put in the request as a joke for his girlfriend, Amy Marsh, who absolutely loves the actor. "Jeff Goldblum holds a special place in my girlfriend's heart. She's a big fan," Freedland, 33, explained. "Amy's foundational affection for Goldblum is the scene in 'Independence Day' when he and Will Smith are victoriously walking away from the smoking wreckage in the desert, smoking cigars and laughing as their women jump into their arms. If this whole thing has an origin point, it's that single scene." As for Freedland, though, "I'm more of a 'The Big Chill' man myself," he joked. "Give me charmingly neurotic Goldblum any day." When the couple from Portland, Oregon arrived at the hotel to check-in, "The desk clerk understandably didn't know it was a surprise and had me sign the little receipt for it, saying 'For the frames,'" Freedland recalled. "Amy shot me a quizzical look and I mumbled something about hotels these days and their weird fees," he said. None the wiser, when Marsh opened the hotel room door, she was floored. "I'd say she was equal parts astonished and delighted,” said Freedland. 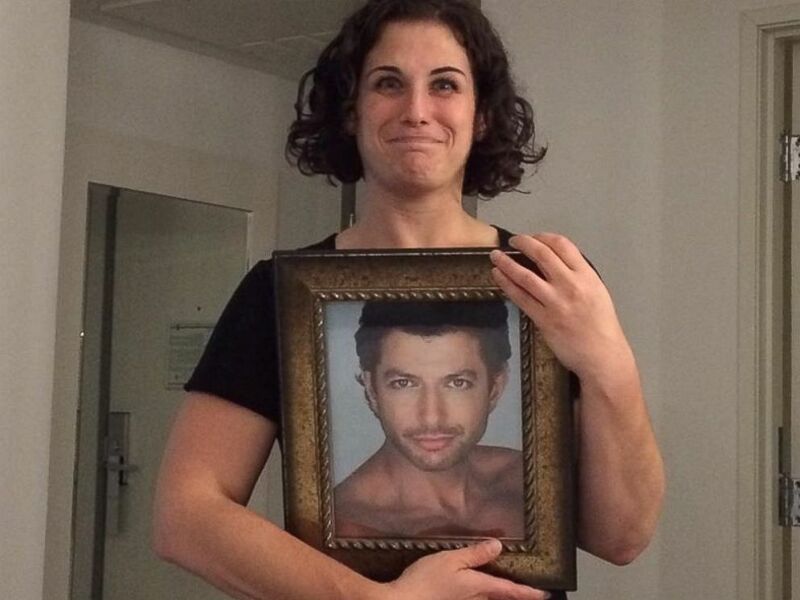 "At one point, she grabbed the shirtless Goldblum photo and made a thunderstruck face. That's the photo of her I took." 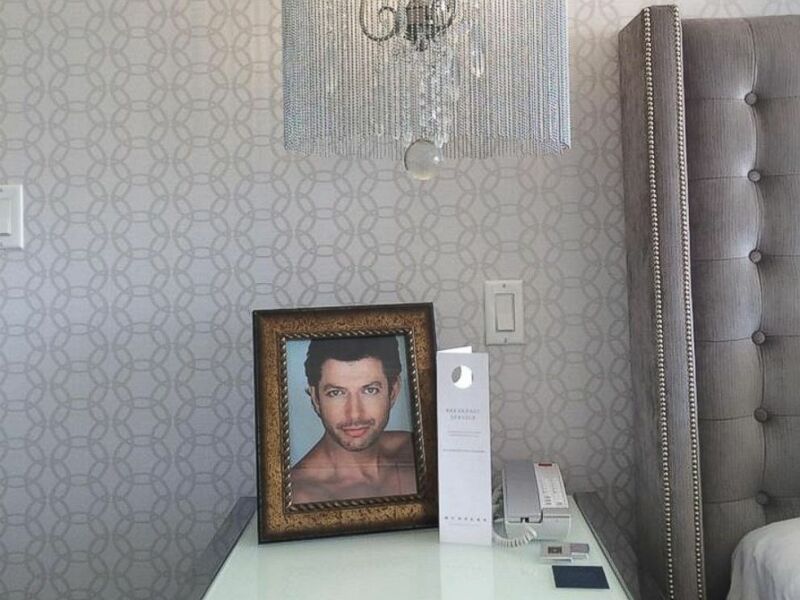 Of course the dynamic duo wanted to take the Goldblum photos home with them after their friends’ wedding weekend. However, in order to do so, they had to divide and conquer. "To fit in our carry-on luggage, we had to divide up the three Goldblums: young and shirtless, zany, and classically debonair. Somehow I ended up with zany, which is currently on my dining room table,” Freedland joked. "I've chosen not to ask what Amy's done with shirtless and debonair."